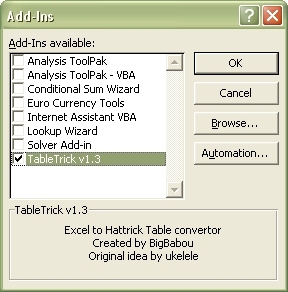 Tabletrick is an excel-addin built by BigBabou, based on an excel implementation by ukelele. The tool was tested in the federation 'Weetjewat' and was built with the help of Weetjewat. 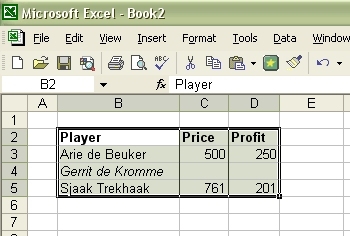 Tabletrick converts selected cells in an excel-worksheet to conference-code that can be pasted into your post on the Hattrick conferences. It is used to create nicely aligned tables with every kind of data you like. Pictures 1 and 2 show some examples of what Tabletrick can do. The add-in is now installed and a new button is placed in the standard toolbar, near the cut/paste group. Also, an About TableTrick... item is placed in the Tools menu. Note: Apparently the Application Data folder is hidden on most systems. 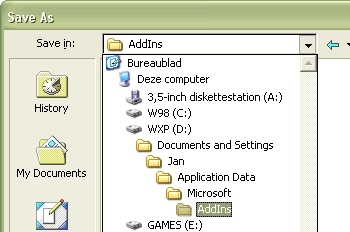 In that case, turn on Show hidden folders under Folder Options... in the Tools menu of Windows Explorer to find the (hidden) Add-Ins folder. The result: see Picture 6. 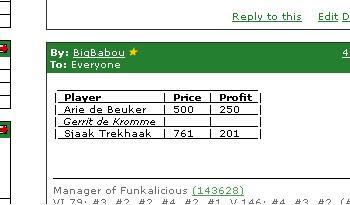 This page was last edited on 26 January 2010, at 02:25.